Ginseng, Tea Tree Oil add-ons available! Is there anything in this world better than a facial? We haven’t found it yet. At New Radiance Cosmetic Center of Palm Beach, we offer indispensable facial treatments that relax while invigorating and revitalizing your face. Treat your skin to the ultimate in health and beauty. Select from the facials below to learn more. This deep pore cleansing facial will restore and revitalize your skin’s healthy appearance. Includes deep pore cleansing, steam, exfoliation, and soothing mask. Results in youthful, refined, and vibrant skin. Aromatherapy oils and a customized mask makes this a soothing and refreshing experience. An excellent facial for teens. 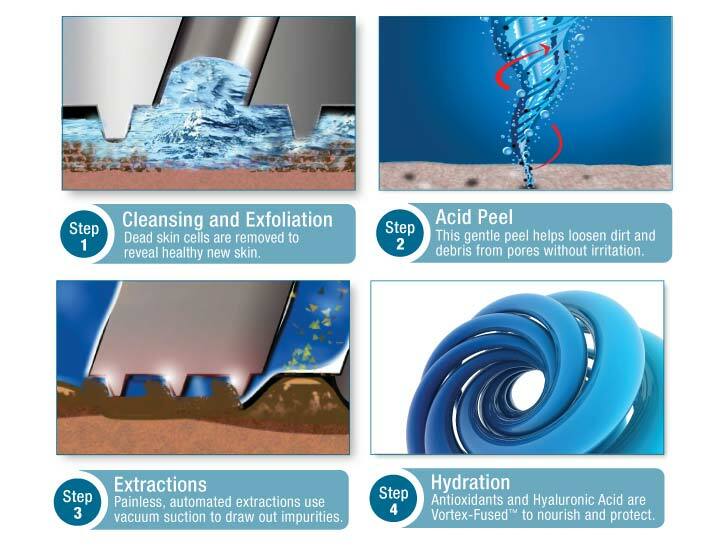 Hydradermabrasion combines cleansing, exfoliation, extraction, hydration and antioxidant protection simultaneously. The treatment is soothing, moisturizing, non-invasive and non-irritating. The HydraFacial™ treatment improves the appearance of fine lines, wrinkles, congested and enlarged pores, oily or acne-prone skin, hyperpigmentation and brown spots. The HydraFacial™ procedure is suitable for most skin types, including thin or aging skin, ethnic skin, and dry skin or oily skin. Start your skin maintenance program now with HydraFacial™ to slow down your skin’s aging process and delay the need for invasive procedures. A must try! Designed to leave your skin visibly hydrated and firm, this facial combats the signs of aging. MicroCrystals, Vitamin C and alpha- hydroxy acids will increase skin’s elasticity, stimulate collagen production and enhance microcirculation. Moisture levels will be immediately restored and the appearance of fine lines reduced. Ideal for mature skin. An effective treatment for inflamed, irritated, acneic skin. It includes a detoxifying mask and soothing, purifying and protective products. High frequency will eliminate bacteria and help with the healing process. Ultra-hydrating, designed to calm and soothe redness due to rosacea or sensitivities. Ginseng and Pearl Mask – Hydrating and rejuvenating. Creates a smooth, supple canvas for all skin types. Lavender Mask – Helps reduce skin inflammation, stabilizes sebum (which is responsible for keeping the skin and hair moisturized), balances and tightens pores, stimulates cell growth and restores healing. Platinum Antioxidant Mask – Oxidizes fatty acids that create wrinkles, spots, freckles, and damage skin cells. It also helps revive the skin’s youthfulness and wellness by continually producing negative ions to enrich the metabolism of the skin cells. Peppermint Mask – This relaxing mask is targeted to treat acne-prone, blemished, and oily skin by helping to relieve congestion, tighten pores and eliminate excess sebum with soothing antiseptic and anti-inflammatory benefits of Peppermint and Tea Tree Oil.